Eating and drinking habits are the biggest factors in preventing childhood cavities. But, just as important as what children eat, is when they eat it. To encourage positive eating habits and prevent cavities, limit eating time to 4 or 5 periods during the day (rather than continuous snacking). By reducing the amount of time that food directly contacts teeth, you help reduce the formation of bacteria and plaque. Additionally, avoid meals and snacks that have a large amount of sugar. Even natural options like fruit and juice leave behind sugar residue that can easily damage baby teeth, so remember to brush properly after each meal! Encourage good oral hygiene in your children by teaching them to brush and floss properly. It’s the second most important factor in preventing cavities for children, and the benefits will stay with them well into adulthood! Children under 7 typically need help or supervision to ensure proper brushing takes place, and one of the best ways is to lead by example! 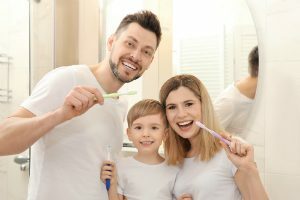 Show them that even adults need to brush their teeth, and it’s a great opportunity to show them proper technique (flossing included). Explain why it’s important to clean ALL parts of the teeth, and use positive reinforcement to reward good behavior. Fluoride is important for both children and adults. It encourages remineralization of tooth enamel (preventing caries), and helps strengthen the developing teeth of children, even before they emerge from the gums. While many municipal water supplies include fluoride in ordinary tap water, you may not be receiving the full benefits if you use filtered or bottled water. Those without ready access to fluoride in their diet should consider topical fluoride treatment during dental checkups, or ask about fluoride supplements available in tablet or drop form. Additionally, we always recommend using toothpaste with fluoride!